The Galveston Orientation and Amnesia Test (GOAT) is an instrument originally created by Levin, O’Donnell, and Grossman and first published in 1979. It was developed to evaluate cognition serially during the subacute stage of recovery from closed head injury (CHI). This practical scale measures orientation to person, place, and time, and memory for events preceding and following the injury. The GOAT assesses post-traumatic amnesia (PTA) and retrograde amnesia (RA) in patients who have had a severe traumatic brain injury (TBI). The GOAT is designed to be a practical, reliable scale that can be used at the bedside or in the emergency room by health service providers of various disciplines. It is important in determining outcome and prognosis. The Galveston Orientation and Amnesia Test is primarily used on traumatic brain injury patients with closed head injuries. Modified versions of the GOAT have been designed for use in patient limiting conditions. The 10 items comprising the GOAT are presented orally to the patient in the order as seen in the image to the right. 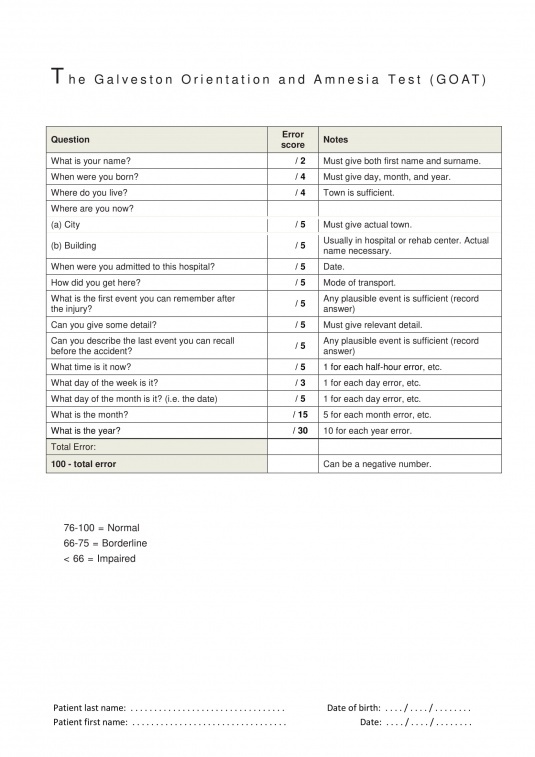 The test form has space for recording the patient’s responses in the error score column. Error points which are points to be deducted for an incorrect response, appear in the error score column. Details on how to calculate error scores when listening to the patient’s response are provided in the notes column. The total GOAT score is obtained by deducting the sum of the error points from 100. There are variations of the GOAT which have been created to address patient limiting conditions. Written GOAT is administered to patients who can comprehend the GOAT questions but are unable to communicate due to motor speech impairment. Modified GOAT (GOAT-M) was created for patients who can comprehend the GOAT but are unable to communicate due to written impairments. COAT is also used for children and adolescents who are in the early stages of recovery from traumatic brain injury. A-GOAT test, it was developed for use with aphasic patients (TBI), it is the GOAT administered in a multiple choice format. The A-GOAT test allows for comparison of aphasic and non-aphasic patients using the same standard testing. It includes 10 items with a 3-choice response format. The duration of post traumatic amnesia (PTA) is defined as the period following coma in which the GOAT score is <75. PTA is considered to have ended if a score ≥75 is achieved on three consecutive administrations. A low GOAT score is associated with hospitalization and post-concussion syndrome at early follow-up. Score of ≥75 for two consecutive days, no longer in the post-traumatic amnesia phase. Score between 66 and 75 for two consecutive days, borderline status. Score <66, the patient for two consecutive days, patient still in the post-traumatic amnesia phase. A low GOAT score is associated with hospitalization and post-concussion syndrome at early follow-up. In his study, Levin reported that the GOAT is an important measurement of the severity of acute CHI and can be used as a predictor of injury prognosis. Similarly, Bode concluded that the duration of PTA after a TBI provided one of the earliest and best predictors of long-term outcome. Also, it was reported that patients with retrograde amnesia recovered significantly sooner than patients with anterograde amnesia post-TBI and that RA assessment alone had a significant and novel utility in post-TBI assessment. Multiple studies have shown that health practitioners, including physical therapists can effectively utilize the GOAT as a predictor of TBI progression and prognosis. Furthermore, using the GOAT to understand a patient’s prognosis post-TBI would be essential in determining that patient’s suitability for physical therapy and the level of involvement of a physical therapist within the healthcare team. Physical therapists would have more involvement in patients with a positive long-term prognosis in the later stages of recovery, while medical clinicians would likely administer medical treatments for those with a poor prognosis, in the early stages of recovery. The developers of the Galveston Orientation and Amnesia test determined that the GOAT provided clinicians, including physical therapists with pertinent information regarding on-going treatment and discharge planning. Physical therapists may use the GOAT in combination with other cognitive scales as a means of serial cognitive assessment to monitor the clinical course of neuropsychiatric disorders, including traumatic brain injuries. The inter-rater reliability of the total GOAT is r=0.98 with an agreement via Kappa coefficient of k=0.73. Reliability coefficient for individual items on the GOAT has a Kendall correlation coefficient of 0.99. The research for this is not recent and should be updated. The test-retest reliability coefficient for GOAT is predicted to have a low value. Looking at construct validity using the Rasch mathematical analysis, researchers found that the constructed item hierarchy for the GOAT confirmed previous research, mostly that the focus should be on the person, that place and time comes before dealing with memories surrounding the injury. GOAT scores correlated positively with the Glasgow Coma Scale (GSC) scores (r=0.456, p<0.002) as well as with the admission and discharge Functional Independence Measure (FIM) scores (r=0.701 and 0.531, respectively). When looking at predictive validity, PTA, measured by GOAT scores, is a significant independent predictor of functional outcome (p=0.00005) as assessed by the DRS (disability rating scale) and FIM total, motor, and cognitive scores. The duration of PTA as assessed by GOAT was significantly associated with employment status at one-year post-injury. Performance on the GOAT was also associated with long-term outcome (at least 6 months post-injury) rated by the GOS (Glasgow Outcome Scale)(p<0.0001). The advantage of GOAT is that it provides an objective rating of early cognitive recovery eliminating the need to utilize ambiguous terms such as “confused." Another advantage of the GOAT was from a study conducted by Bode et al. which suggested that a Rasch analysis demonstrated the use of the GOAT for assessing patients with a wide range of cognitive impairments given the items on the test represent a wide range of difficulties. In the GOAT, for items in which partial credit is used, Rasch analysis revealed step disorder. By organizing the response categories to a simple dichotomy (e.g. right versus wrong) it was shown to solve the disorder and allow the construction of an equal interval measure from the GOAT. With modifications in the item scoring of the GOAT, researchers were able to eliminate unreliable differentiation in responses, developing an equal-interval measure of PTA that displayed good reliability and validity. When looking at the GOAT, it is also important to incorporate an age correction factor in order to reduce the possibility of an age effect when comparing younger with older populations. ↑ Fürbringer e Silva SC, Sousa RM. Galveston Orientation Amnesia Test (GOAT). Revista da Escola de Enfermagem da USP. 2009 Dec;43(SPE):1027-33. ↑ 2.00 2.01 2.02 2.03 2.04 2.05 2.06 2.07 2.08 2.09 2.10 Levin HS, O'donnell VM, Grossman RG. The Galveston Orientation and Amnesia Test: A practical scale to assess cognition after head injury. Journal of Nervous and Mental Disease. 1979 Nov.
↑ 3.0 3.1 3.2 3.3 3.4 Moin P, Khalighinejad N, Yusefi A, Farajzadegan Z, Barekatain M. Converting three general-cognitive function scales into persian and assessment of their validity and reliability. International journal of preventive medicine. 2011 Apr;2(2):82. ↑ Ewing-Cobbs L, Levin HS, Fletcher JM, Miner ME, Eisenberg HM. The Children's Orientation and Amnesia Test: relationship to severity of acute head injury and to recovery of memory. Neurosurgery. 1990 Nov 1;27(5):683-91. ↑ Jain N, Layton BS, Murray PK. Are aphasic patients who fail the GOAT in PTA? A modified Galveston Orientation and Amnesia Test for persons with aphasia. The Clinical Neuropsychologist. 2000 Feb 1;14(1):13-7. ↑ 7.0 7.1 Novack TA, Bergquist TF, Bennett G, Gouvier WD. Primary caregiver distress following severe head injury. The Journal of Head Trauma Rehabilitation. 1991 Dec.
↑ Wade DT. Measurement in neurological rehabilitation. Current opinion in neurology and neurosurgery. 1992 Oct;5(5):682-6. ↑ 9.0 9.1 Zafonte RD, Mann NR, Millis SR, Black KL, Wood DL, Hammond F. Posttraumatic amnesia: its relation to functional outcome. Archives of physical medicine and rehabilitation. 1997 Oct 1;78(10):1103-6. ↑ Ganti L, Daneshvar Y, Ayala S, Bodhit AN, Peters KR. The value of neurocognitive testing for acute outcomes after mild traumatic brain injury. Military medical research. 2016 Dec;3(1):23. ↑ 11.0 11.1 11.2 11.3 11.4 11.5 Bode RK, Heinemann AW, Semik P. Measurement properties of the Galveston Orientation and Amnesia Test (GOAT) and improvement patterns during inpatient rehabilitation. The Journal of head trauma rehabilitation. 2000 Feb 1;15(1):637-55. ↑ Marshman LA, Hennessy M, Delle Baite L, Britton G. Utility of Retrograde Amnesia Assessment Alone, Compared with Anterograde Amnesia Assessment in Determining Recovery After Traumatic Brain Injury: Prospective Cohort Study. World neurosurgery. 2017 Nov 28. ↑ Cifu DX, Keyser-Marcus L, Lopez E, Wehman P, Kreutzer JS, Englander J, High W. Acute predictors of successful return to work 1 year after traumatic brain injury: a multicenter analysis. Archives of physical medicine and rehabilitation. 1997 Feb 1;78(2):125-31. ↑ Forrester G, Encel J, Geffen G. Measuring post-traumatic amnesia (PTA): an historical review. Brain Injury. 1994 Jan 1;8(2):175-84.